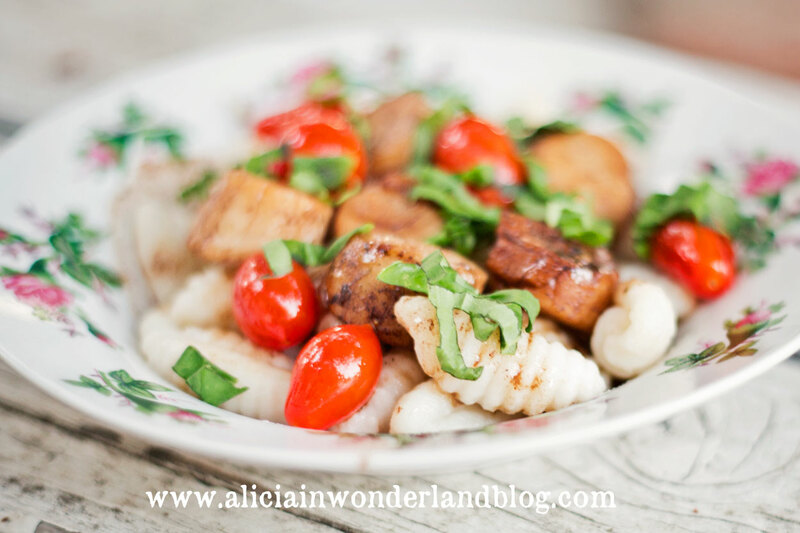 I absolutely love gnocchi, and was so excited to find some frozen gnocchi recently that are both egg-free and gluten-free. I decided to do something a little different with the gnocchi than what I usually do and paired them with scallops. If you have never had gnocchi before, they are delicious little Italian potato dumplings, and a great substitute for pasta. They are very filling so you don’t need as much as you would with pasta. I started by lightly browning the garlic in a few tablespoons of olive oil. While that heated up, I started boiling the water for the gnocchi. Once the garlic is lightly golden, I crushed the garlic and reduced the heat to low. Then I added about 5 tablespoons of balsamic vinegar, the juice from one lemon, salt & pepper. I put in the scallops, and covered while they cooked. Once the scallops were about halfway cooked, I turned them over in the pan. When the scallops were closed to being finished cooking, I added in a bunch of cherry tomatoes with the scallops to lightly cook. I also added the gnocchi into the boiling water. Gnocchi cooks very quickly, so once they were all floating at the top, I strained out the water and rinsed the gnocchi. I combined the gnocchi, scallops and tomatoes and topped with the balsamic mixture left in the pan. To finish the dish, I topped it with a few leaves of julienned fresh basil. So easy and so delicious!